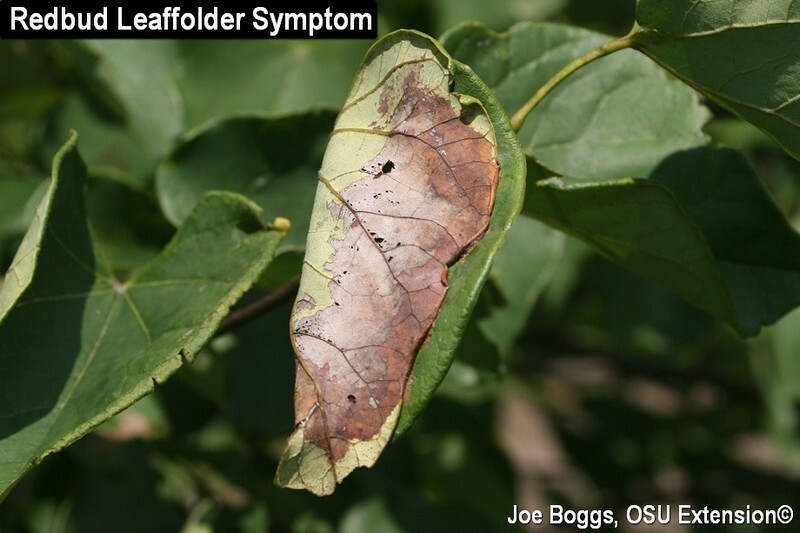 Last season, the unusual leaf symptoms caused by the Redbud Leaffolder (Fascista cercerisella; order Lepidoptera; family Gelechiidae) on its namesake host were observed throughout Ohio. Questions regarding leaves turning brown after being folded over or "glued" together continued to come into Extension offices throughout September. This could be a repeat season based on what I've seen so far. Two-to-three overlapping generations occur per season in Ohio with 2nd and 3rd generation nests containing caterpillars in various stages of development. Populations tend to build with each generation and it appears we are well into the 2nd generation in many areas of the state. The moth spends the winter as pupae in debris and fallen leaves beneath infested trees. The caterpillars of this velvety black moth use heavy silk to produce two types of nests. As their common name implies, the caterpillars occasionally form nests by using silk stitching to fold together opposite leaf edges. They will also stitch together neighboring leaves to produce flat nests much like a leaftier caterpillar. The caterpillars reside in heavy silk tubes within their nests. They partially emerge out of their tubes to feed as skeletonizers, consuming the upper and lower leaf surfaces. The affected areas turn orangish-brown which sharply contrasts with the normal dark green color of the foliage. Early instar caterpillars are cream-colored and have no discernible markings. As the caterpillars mature, markings begin to develop with alternating segments darkening to produce a striking appearance of black and light-green bands running the length of the body. They resemble tiny banded sea kraits (snakes). When disturbed, the caterpillars wiggle back and forth violently further enhancing their tiny snake impersonation. They have great entertainment value! Insecticidal applications are not generally required for managing this moth in Ohio landscapes. Besides, the caterpillars live in protected locations which makes the successful use of insecticides problematic. Most of the damage is produced by 3rd generation caterpillars which occur late in the season after trees have generated and stored enough carbohydrate to support the production of new leaves next season. Consequently, the leaffolder has a limited impact on the overall health of the tree even during localized population outbreaks. Where practical, populations can be reduced by pinching nests to kill caterpillars. Raking and destroying fallen leaves will also reduce localized numbers by eliminating overwintering moth pupae.